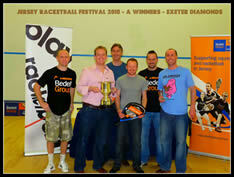 Exeter Diamonds won the inaugural Jersey Racketball festival in what proved to be a hugely successful and sociable event. 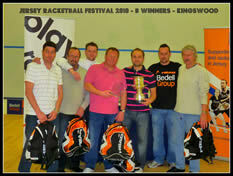 Club Kingswood won the B title against a very competitive field and players from all teams commented on the vibrant feel of the festival in general. 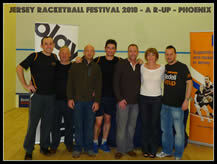 Over a dozen teams from all over the UK played at different venues across the island including Le Quennavais, Fort Regent and the Jersey SRC. There were some fantastic matches across all grades with teams scheduled to play four matches from Friday to Sunday.